On June 15th, Colombians went to the polls to choose their next president. Former Finance Minister Óscar Iván Zuluaga had pulled off an upset win in the first round of elections on May 25, besting the incumbent President Juan Manuel Santos by a margin of 29.3 to 25.6%. After the defeat, Santos went on the offensive, attempting rouse the supporters around the county who had stayed home and contributed to the low voter turnout that cost him a win. Even after Santos picked up the endorsement of many left-leaning parties and politicians as well as some members of the Conservative Party, polling just one week ahead of the election showed him trailing his opponent by an eight point margin (41% to 49%). Nevertheless, on election day, Santos emerged the clear winner, taking nearly 1 million more votes than Zuluaga and garnering 51% of the electorate compared to his opponent’s 45%. Last year, Zuluaga publicly defended himself against accusations that he was an “Uribito” (a “Little Uribe”). Uribe is constitutionally prohibited from seeking another term as president, but he was elected to the Senate earlier this year along with a significant bloc of representatives from his hard-right Democratic Center (CD) party. Many viewed CD candidate Zuluaga as a surrogate for Uribe in the presidential elections. Santos served in then-President Uribe’s cabinet as Defense Minister alongside then-Finance Minister Zuluaga until 2009. When he was first elected President in 2010, Santos generally adopted his predecessor’s economic and security policies as his own. But a major rift developed between the former and current heads of state when Santos agreed to open a peace dialogue with the rebel group known as the Revolutionary Armed Forces of Colombia, or FARC, in late 2012. Uribe and Zuluaga essentially deny the existence of an armed conflict between the guerrillas and the government, instead referring to the FARC as terrorists and criminals. According to Adam Isacson, a Senior Associate for Regional Security Policy at the Washington Office on Latin America, their hardline stance against the rebel group leaves little room for negotiation. The internal armed conflict between the Colombian state and the guerrilla group has displaced an estimated 5.7 million people and has resulted in the deaths of hundreds of thousands over the half century that it has been waged. 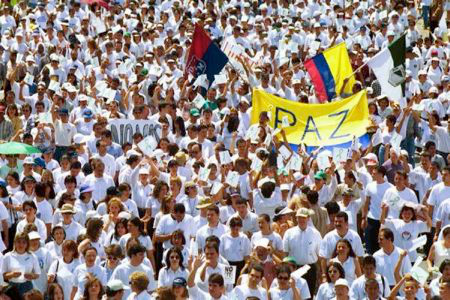 Aggressive anti-FARC campaigns in recent years have whittled the group’s size from a peak of around 18,000 members in the early 2000s to around 8,000 today (albeit at the expense of much bloodshed and various human rights abuses by both sides). Still, the rebels have continued to carry out kidnappings and attacks against security forces as well as civilian targets. While Colombians may have voted in favor of the peace process, it has progressed slowly and faces significant obstacles going forward. The negotiators have reached agreements on three of the five discussion points, including agricultural reform, the incorporation of the FARC as a political party and cooperation against the illegal drug trade, but the two most contentious issues remain unresolved – the final demobilization of FARC forces and reparations for victims of the conflict. The negotiating framework stipulates that “nothing is agreed until everything is agreed.” In other words, should the talks break down for any reason, neither side would be obligated to honor the agreements reached thus far. Furthermore, if both sides do reach a final accord, its provisions must be approved by a nationwide public referendum, which could prove difficult to pass if citizens view the terms as being too favorable to the FARC. Days before the election, President Santos announced that he had opened a dialogue with another, smaller rebel group known as the People’s Liberation Army (ELN). Those discussions will explore the potential for a creating a negotiating framework with the ELN similar to the one established with the FARC. Although Santos’ victory ensures that both efforts will continue, it is far from a guarantee that they will succeed. Recent reports suggest that gang warfare in the Pacific coast region may have replaced the armed conflict as the main driver of civilian displacement in the country. Inter- and intra-gang conflicts over the control of drug distribution routes and points of sale in the department of Valle del Cauca have helped make it Colombia’s most violent department for four straight years. Despite economic “shock” plans aimed at addressing mass unemployment and militarized security operations to quell rampant violence, the port city of Buenaventura remains impoverished and crime-ridden. Cali, the department’s capital and largest city, was one of the most dangerous cities on Earth last year. Although the national murder rate has fallen by nearly half since the militarization of the US-backed “Plan Colombia” security campaign in the early 2000’s, the current murder rate of 30.8 per 100,000 citizens is still the tenth highest in the world. Insofar as it has succeeded, Colombia’s crackdown on the drug trade has largely pushed production and distribution into nearby countries, like Argentina, Peru, Mexico and areas of Central America and the Caribbean. Sanho Tree, Director of the Drug Policy Project at the Institute for Policy Studies, said that “Colombia has a lot of internal issues that need to be dealt with in the event of a peace deal. I think they probably need more help with tax collectors and auditors than military advisors.” Tree says that there has been collaboration in the drug trade between elements of the FARC and organized crime groups for years, which will probably continue even if a peace deal is reached. Santos staked his campaign on the peace negotiations, but the issues Colombians cited as more important to them than the talks – poverty, education, healthcare and crime – have not disappeared. 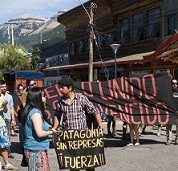 Farmers, municipal workers, miners and students did not take to the streets last year to demand a deal with the FARC. They were demanding a revision of the government’s economic policies. Despite gains against unemployment and poverty in recent years, Colombia remains one of the most unequal countries in the region. Illiteracy remains a problem, especially among the poor. Crime and violence will be ongoing issues even in the event of a peace deal. Should the new Santos administration achieve an end to the world’s longest-running armed conflict, it would be a historic and commendable achievement. 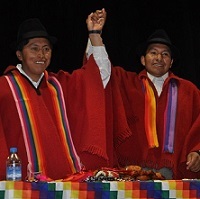 However, solving the problems that were largely undiscussed during the recent election is an equally important and demanding task for the new Santos government. Mike LaSusa is writer and researcher based in Washington DC. He earned a communication degree with majors in journalism and international studies from the University of Miami in 2013. As of fall 2014, he will be working toward a master’s degree in US foreign policy at American University.